The HoodieCarrier was invented, designed and manufactured by JPMBB, so obviously it's a natural extension of the same DNA as our other baby carriers. Quality, reasonable price, respect for physiology and practicality- these are its buit-in features. • We want to offer, with this BabyCarrier, we wanted to give you a tool that blends even more subtly into the world of today’s parents, without cramping your style or imposing the childcare look. • We believe that parents today should have the choice of a PREMIUM baby carrier, but at a realistic PRICE. • The fabric of the baby carrier is made of a 3D breathable all-seasons material offering a soft and slightly stretchy wrap-like feeling – OekoTex 100. Each side of the baby carrier is cotton. You’ll find a different kind of comfort than in the PhysioCarrier, for those who already know it, while the feel and the way this new fabric adapts to the contours of Baby’s body will remind you of the wrap. 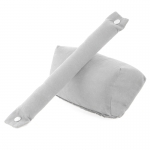 JPMBB Booster for PhysioCarrier Lightgrey ACC13 | .